It isn't to late to set some goals for the year. Set reachable goals and reap the benefits. Goals give you a purpose and direction. It can be fun to let your genealogy research lead you wherever it wants. But goals lead to more productive research. 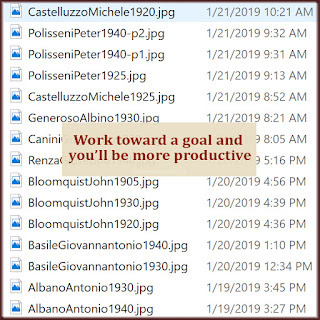 I set 7 genealogy goals for 2019. The first 3 are finite goals. They aren't "I hope I can discover…". 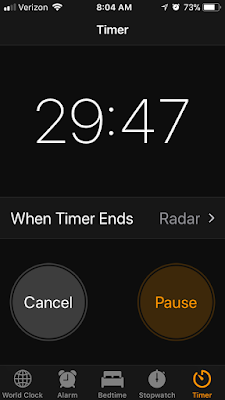 They are "do this task until it's finished". This one is done! I want to create a digital, searchable database of every key fact from 1000s of documents. I downloaded birth, marriage, and death records from my 6 ancestral Italian towns. 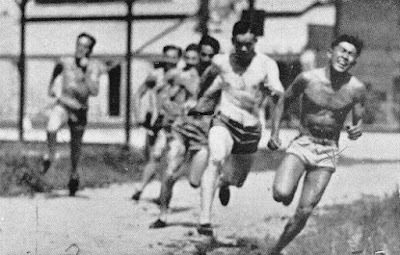 They start in 1809, and some go into the 1940s. Because it's an insanely big project, I broke off a chunk—5 years of birth records—to encourage myself to get into it. I'd already transcribed a good amount of the 1809–1813 births, so this wasn't an accurate test of how long the whole project will take. But the benefits are real. After I finish the next 2 goals, I want to work on the 1814–1818 birth records. That eagerness to continue is exactly what I was shooting for. Dive in and start those goals. Look what I found in 3 sessions. I'm going through the alphabetical list of people in my document tracker spreadsheet. I'm focusing on which names have a missing census form in their "Need to find" column. Right now I'm into last names beginning with C, and it's been a very satisfying three days. I've added a lot of missing documents to my family tree. Sometimes while searching for a census form, I can't help but see the death record or marriage index that I was missing. So I'll grab those while I'm at it, too. Crop it in Photoshop if needed. Rename it using the style I've developed. My file naming rules make it easier to find any document. Add it to the family tree record of each person named on the document. 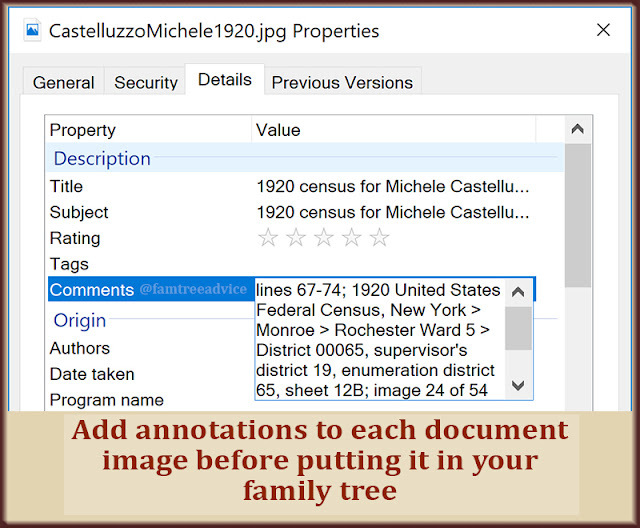 That means each family member on the census form gets a copy of the census sheet in Family Tree Maker. Add each fact and the source citation to each person. Each family member will get a Residence fact based on the census image. Those with a job will get an Occupation fact, too. And all facts get the proper source citation. Other facts can include immigration year, naturalization year, birth and marriage years. Update my document tracker spreadsheet. This is my inventory and to-do list rolled into one. It's important that I keep it accurate. One thing I decided after starting this goal was to be reasonable. If several search techniques don't get me the census I need, I will move on. The important thing is to make a good effort. You can add notes and a title to every document image you collect. I started this goal last year. A DNA analysis method pointed me to a specific last name from my grandfather's hometown. Someone with this name is highly likely to be a direct ancestor for both my parents. Their DNA says they are 4th to 6th cousins. My true goal is to find my parents' connection by analyzing these babies. I'm working my way through my downloaded collection of vital records from Grandpa's town, adding each of these babies to my tree. I add their parents and try to ID their grandparents. If they aren't connected to anyone in my family tree yet, I give them a profile picture that says "no relationship established". If I find their connection later, I'll be sure to remove their relationship graphic. It's still January, and I'm having an insanely productive genealogy year already. I plan to bounce between goals 2 and 3 to avoid boredom. That'll make me feel like I'm accomplishing more, too. It's still January, and it's only January. 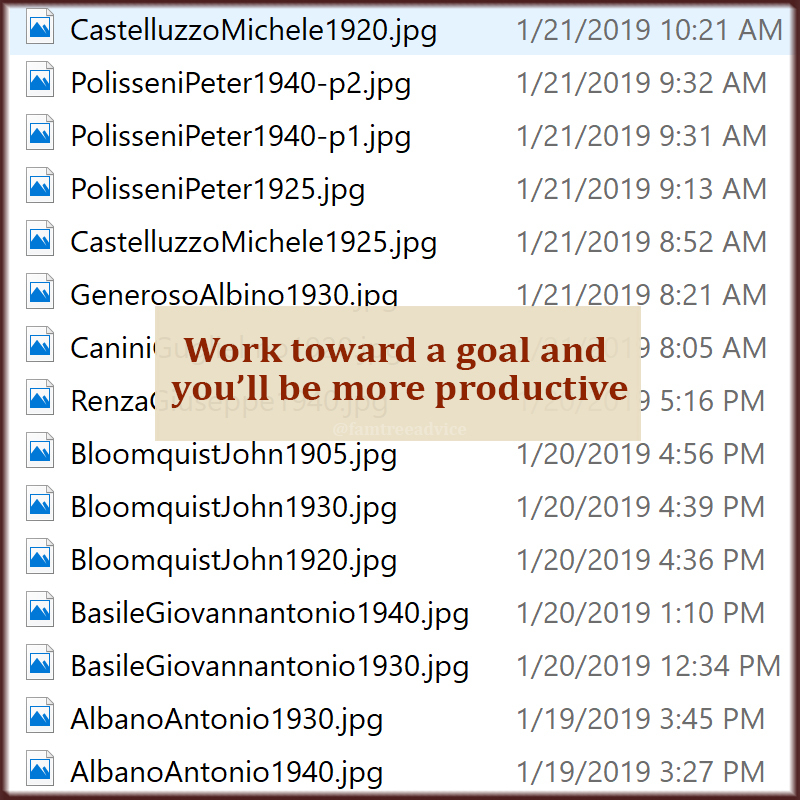 Have you set your 2019 Genealogy Goals? Does this sound familiar? You haven't worked on your genealogy in a while because you're busy at your new job. Or your kids had the flu. Or you haven't had a weekend to yourself in months. It's easy to postpone your family history research, even though you love it so much. But if you put it off, your research plans are no longer fresh in your mind. It gets harder and harder to pick up where you left off. You can feel as if you're not getting anywhere. You can break that cycle! By carving out even the smallest amount of time each day, or several days a week, you can keep your head in the game. Here are 4 things you can do in a small block of time that will strengthen your family tree research. 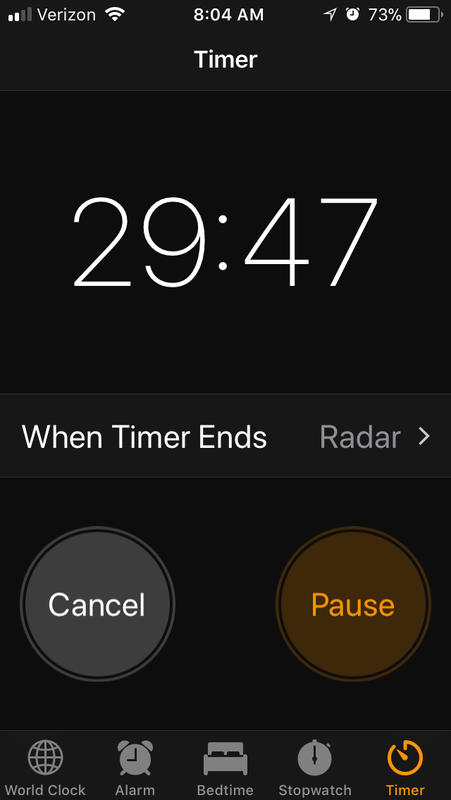 These are tasks that don't demand you spend several uninterrupted hours. If you're disciplined and take research notes, you can make progress on the big picture each day. In small blocks of time. bring your laptop or tablet with you when you're waiting to pick up the kids or see the doctor. Or while you get someone else to clear away the dinner dishes for a change. Genealogy is a fascinating, time-consuming hobby that we love. But don't think of it as requiring six hours at a time. With some planning, you can keep up your momentum and make progress. You only have to try. You've seen the memes. Genealogists would rather spend every moment working on their family trees than, say, eating, sleeping or dealing with people. Do you have the luxury of 100% free time? I don't either! Don't worry. You can still make significant progress on your family research in short bursts of time. Have about an hour after the dinner table is cleared? That'll do. Have some free time in the late afternoon before the family gets home? That's great! Are you an early riser? It's genealogy time! Arm yourself with a list of tasks and a progress chart, and a small window of time can yield big genealogy progress. Here are some examples. Last night I was too exhausted to spend much time on genealogy. So I chose a specific ancestor from my "grandparent chart". I chose one ancestor from the chart whose parents were missing. I found him in my tree to see what I knew about him. Then I examined his children's marriage records to see if they contained the names of their grandparents. In the short amount of time I had (before I fell asleep at the keyboard), I added a few marriage document images to my tree. I can pick up where I left off when I have another chunk of time. I have a few items on my Task List in Family Tree Maker that involve making my tree better. One task is to replace some of my weaker sources with strong ones. So, when I have some time, I can go to these people in my tree and do the legwork. I can replace the "a cousin told me" source citation with more concrete facts and documents. That's a great use of time. Ever since I discovered this trick, it's been a must-do task for me. 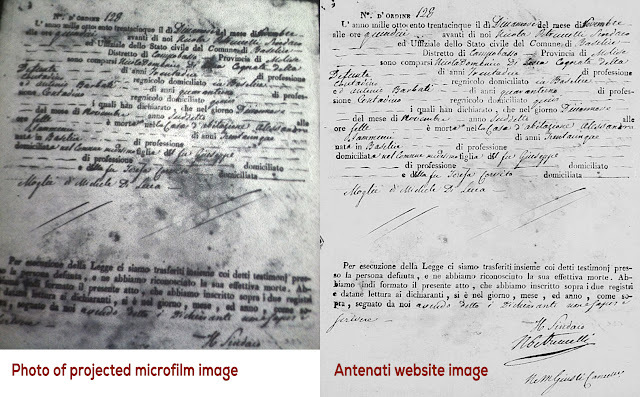 Before I attach a downloaded document image (vital record, census sheet, ship manifest, etc.) to my family tree, I add facts to the image itself. Each time I have a new document to add to my tree, I edit its properties. I include a descriptive title, the name of its source and the URL it came from. Once I add it to my family tree, all I need to edit there is the date field and the category. I'm a strong believer in keeping a spreadsheet inventory of my found documents. My document tracker contains more than 1,500 names of people in my tree, and each document I've found for them. (See "Track Your Genealogy Finds and Your Searches"
His 1958-or-so trip back to Italy—his one and only trip home since arriving in New York in 1920. My document tracker makes it very easy to see what I can search for when I have some time. Don't worry about not having countless hours to spend working on your family tree. By spending a little time on your family tree more frequently, you will see true progress. You'll feel a sense of accomplishment. And you'll know your family tree—your legacy—is better and stronger than it was yesterday. Ten years ago I needed to take control of my family tree digital files. I had a growing collection of census forms, draft registration cards, vital records, and more. LastnameFirstnameWW1 for a draft registration card, etc. But my well-named image files, sitting in all those different folders, didn't show me the big picture. How could I see at a glance every document I have for a particular ancestor? And how could I quickly see which documents are missing? That's when I turned to my old pal, Microsoft Excel. For years I'd been using Excel spreadsheets on the job. I tracked progress on large-scale projects. I built formulas to show an accurate cross-section of the content on a website I manage. I kept tabs on my freelance hours for invoicing. So why wouldn't I use Excel to create a genealogy research inventory? My genealogy "document tracker" has 1540 lines right now. I have one person on each line. There are columns for each type of document I collect. The last column gives me space to note what's missing. Now it's time to get even more value out of my document tracker. anyone in my family tree. The research logs I found were much more complicated than I wanted. For starters, I'm satisfied with the list above. So I've added a second sheet to my document tracker Excel file and named it Research Notes. The first column is for the person's name. I added four more columns to match the four items in my list. 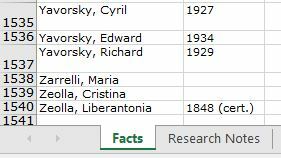 The next time I'm trying to find a specific document—like the elusive 1940 census for the Raffaele Saviano family—I'll add a line to the new Research Notes worksheet. I might note that I tried searching for the family using only their first names. And that I used Americanized versions of their Italian names. I'll add that I tried this on Ancestry.com and FamilySearch.org. When I'm ready to call it quits for the moment, I'll add a note about what I think I should try next. 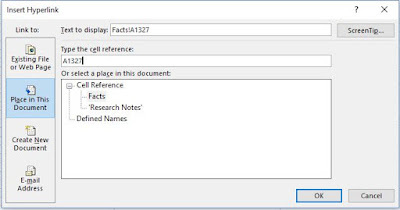 Finally—and this is a cool Excel trick—I'll add a link from this research note to Raffaele Saviano's line on the first worksheet where all of his documents are listed. And I'll add a link from there back to his line on the new Research Notes worksheet. My favorite thing about linking between the sheets is this: You can reorganize the lines on either worksheet and not break the links. You can sort them, add new lines in the middle, do whatever you need to do, and the links will still work. Make a mental note of which line number holds your ancestor on your new Research Notes worksheet. For example, I have Raffaele Saviano on line 2. Click the empty cell where you want to add the link. You'll want to devote a column to these links. 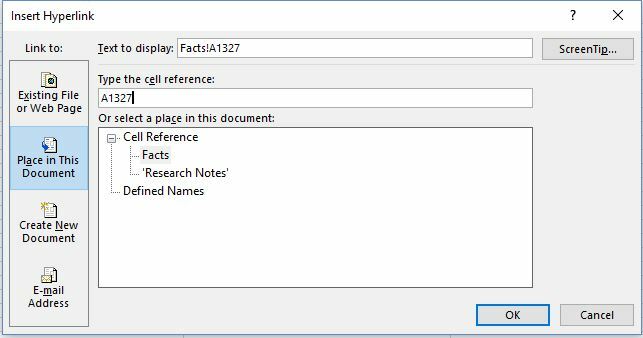 In my example, I'll go to Raffaele Saviano's line (1327) on my Facts worksheet and click in the empty "Link to Notes" column. On the Insert toolbar or ribbon, click Link and choose Insert Link. 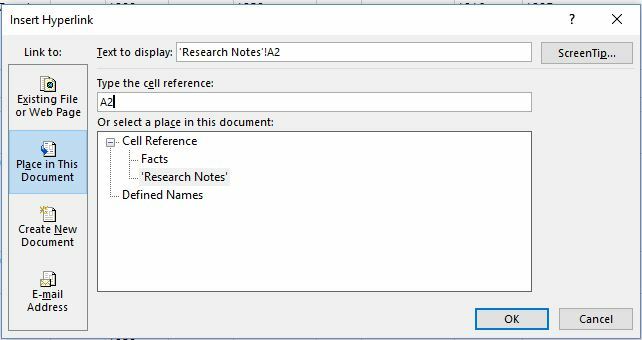 Click to select the name of your new research notes worksheet. In the field labelled "Type the cell reference" it may say "A1" by default. Change it to A2, or A and whichever line number you need to link to. Click OK and you'll see your link. Now make a mental note of the line number for this ancestor on the Facts worksheet. Go to the Research Notes worksheet and link back in the same way. Click the links to see them work. Now you can have all of these facts at your fingertips. It's 100% searchable, sortable, and update-able. Download a sample spreadsheet to build on. My favorite thing about Excel: I know it can do a million more things I haven't even thought of yet.